Slice the tenders into thirds. Mix all the marinade ingredients. Marinate chicken in sauce for one to two hours. Slice the bread into rounds and toast on both sides. Slice the cucumber into rounds. Rip the mint leaves off the stalk and remove any larger stems. In a hot frying pan, add the chicken but do not add the excess liquid. Sear the chicken on all sides and cook about 5 minutes. Add the remaining marinade and cook another 5-8 minutes until the sauce has thickened and browned and the chicken is cooked through. Top the bread with a mint leaf, a cucumber slice and a chicken chunk. Serve immediately. Kentucky Derby or not, these Mint Julep Chicken Crostini bites are perfect for any party. I think that mint is the most underutilized herb in the American kitchen. We have adapted it into our desserts and drinks, and it occasionally makes an appearance alongside lamb, but I just love mint in savory dishes of all types. I really started liking it when I was eating a lot of Vietnamese noodle salads, so I started integrating it into all sorts of dishes. This Mint Julep Chicken Crostini takes a page from that noodle salad, pairing the mint with a cucumber, but that is where the similarities end. It mostly follows the mint julep flavor profile, with some sweetness and bourbon in the chicken marinade and the fresh mint on the bread to give it just the right bright bite. Marinade the chicken with some bourbon, honey, and Worcestershire sauce. Then brown it up at a high heat. 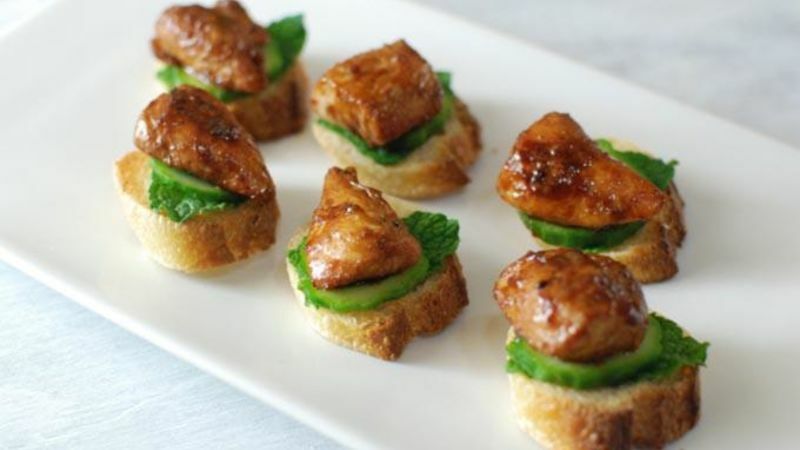 Assemble the appetizers – bread, mint, cucumber and chicken. Such a fresh and unique bite of food. The perfect app for your Derby Party! Dan Whalen doesn't love mint juleps, but loves this dish. He has been blogging for over 6 years at The Food in My Beard. Check Dan's Tablespoon profile often to try his recipes with a creative international spin.